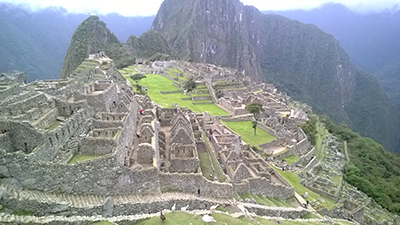 November 2 dawned slowly with fog, and then rainfall in Aguas Calientes, also known as Machu Picchu Pueblo. Jefferson and I met my sister Janet and brother-in-law Mike for breakfast, and we went over the plan for the wedding ceremony. Once the rain lifted, we boarded the bus to the Machu Picchu City, from whence we climbed Machu Picchu Mountain (since Huayna Picchu Mountain route was overbooked for the next two weeks). Those Incan stone stairs are daunting! How many stairs did we climb to the top of the mountain? We were greeted at regular vistas with gorgeous views of Machu Picchu City, the upper terraces on Huayna Picchu peak, and the bowl of mountains surrounding us. We were also greeted by people from the world over: Puerto Rico, Canada, Italy, Costa Rica, and even Notre Dame College students of Jefferson’s son-in-law Grant. After photos and an avocado at the peak, we headed down. My Lyme-lame knees found the descent more difficult than the assent; but slow and steady worked. 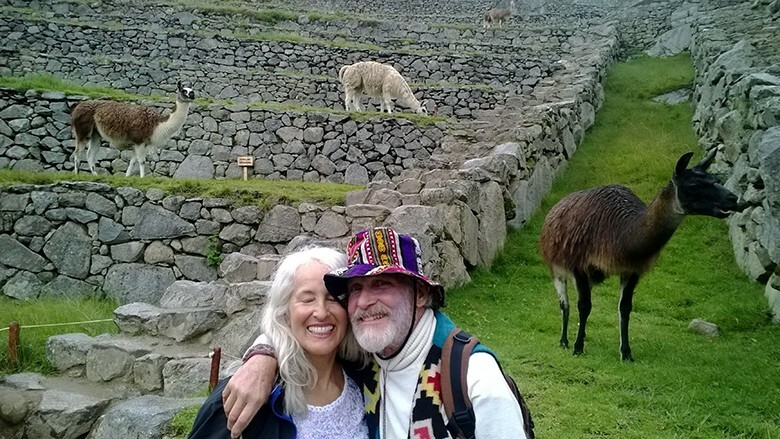 Jefferson had embraced the Intiwatana as the most sacred spot within the amazing Machu Picchu City – so we should marry there. Graced by the finest stonework, Itiwatana is the highest point… features “image stones” or “echo stones” …reflecting the triangular peaks, and has the best views of the surrounding mountains – regarded as sacred by the Incas. So we gathered there with Janet, Mike, and two other men: Anthony from New Hampshire and Manju, from northern Peru. We waited for a tour group to clear, and then I lit a candle. Within moments a guard appeared, telling us we were not allowed to do any ceremonies here. Okay. We gathered up, and moved quickly down the staircase, out past the Sacristy, and on to the Sacred Plaza. Jefferson led us east, around a wall, past two guards who looked at us keenly, one on the telephone, undoubtedly alerted by the previous guard. Finding ourselves in a quiet spot looking northeast, Jefferson said “Let’s do it”. We faced one another, while Mike and Janet, holding keys and camera stood across, with our two guests aside. We began to exchange our vows, slightly rattled but determined. Suddenly a guard appeared at the far end of this small courtyard. He crossed his arms and observed us. We continued, without concerning ourselves. Let him act, if he must. But he simply observed silently. Once we were done, he began to speak. I’ll ask Janet to recall all he said in Spanish. But he clearly approved, acknowledged and bless our union. He spoke at length about the value and treasure of love. He approached us, and embraced each of us. He was happy to have pictures taken with all of us – thanks to Mike, since my camera battery went caput that morning. And a second guard came around this time, and stood aside in silent approval. Hence our marriage received official blessing! Best of all, we were surrounded by loving family and new friends, witnessing our commitment. With the enthusiastic support of the guard, we did not complete the exchange of rings after our vows. So we went a few steps and found ourselves in an intimate, exquisitely constructed fountain room. We clasped hands over the water spout, and Janet gave me Jefferson’s ring to give him. “I do”, he promptly responded. Mike gave Jefferson the ring for me. Yes, I take this man as my lawful wedded husband. I do! 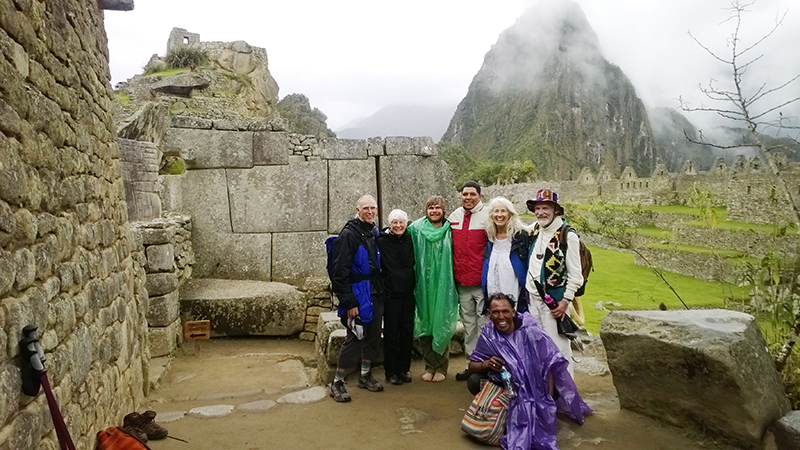 What a fabulous blessed day we have had in Machu Picchu. This sacred place offered us a gorgeous opportunity to confirm our love and commitment, feeling transported by the grace of our ancestors. May the blessings we received vibrate out to all of you and, as our dear friend Kelly said, “remind us of the abundance that is possible for all people”. Thank you, my friends, for your good wishes for us.